Sunny Health & Fitness SF-B2721 Comfort XL is a lightweight, compact and foldable upright- semi-recumbent belt-driven exercise bike with magnetic resistance and a modern design. It is suitable for use by users of different fitness levels at home and not at commercial gyms. You will feel comfortable on its very large and padded seat with backrest during your long sessions. It is built sturdy and durable, with a decent user weight capacity of 300 pounds. It runs smoothly and quietly and your ride will feel stable with the smooth and durable belt drive that doesn’t require much maintenance. It will help you be stronger and healthier and have more energy. There are ten levels of adjustable magnetic resistance with a convenient tension knob on the smooth 3.3-pound flywheel on this powerful and great quality upright semi-recumbent bike. 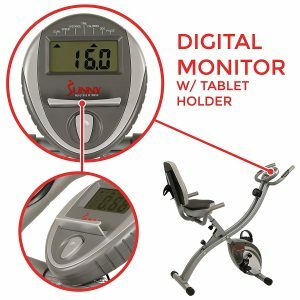 It comes with a small LCD-backlit performance monitor that indicates the distance, speed, time, calories, ODOmeter, Scan and pulse rate for a heart rate reading as you hold the pulse grips on the fixed handles. You can put your smartphone on the small tablet holder just below the display. The very large recumbent bike is totally adjustable to three levels of recline with a minimum inseam of 22 inches and a maximum of 28 inches. It is totally customizable and the padded seat can be adjusted up and down with the foldable side handles for you to mount and dismount easily. The handlebars are covered with foam and the pedals have the adjustable straps, both helping with safety, balance, and comfort. It weighs 38 pounds and measures 35 x 21 x 50 inches- is both lightweight and compact. It has the folded dimensions of 12.5 x 20 x 57 inches as you fold the handles and fold the bike in half. You can roll it on its transport wheels and you can get it out of the way easily, lean it against a wall or put it in your closet. There is a water bottle holder just at the back of the seat and you can stay hydrated during your workout without having to get on or off. The extra padding on the seat and the backrest will help with a proper blood flow to your body- especially in glutes and pressure points in the tailbone during your long session. Sunny Health & Fitness ComfortXL is made in China but stocked in the US and the shipping will be quick- usually within a couple of days. It is offered with a three-year warranty by the manufacturer as a proof of the quality of the construction.